This is what I was up to last night. Only 3 blocks from my house, too. Anybody want to take a guess who that performer is? I can't tell. Is it Johnny Depp? No clue, but it looks like fun. Jonatha Brooke? Suzanne Vega? Antje Duvecot? 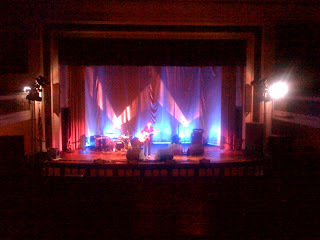 Suzanne Vega last night, so good. I'll do a full report later. Antje Duvecot is a folk singer in the vein of those other ladies I mentioned. One of her songs (Merry-Go-Round) is featured on a Skank of America t.v. spot - Mr. Chili and I heard it, TiVoed back to find lyrics, did a Google search, and came up with her. A tiny bit more digging revealed that she was doing a show LITERALLY five minutes away the following week, so we got tickets and sat five feet from her while she played her guitar and sang. She's a lovely singer. I'll be seeing Ms. Vega on Aug. 28 in Hyannis, she's sharing the bill with Marc Cohn. I haven't seen a Suzanne Vega concert in forever. You'll have to tell me if you see her again in the future!